Every Company registered under companies Act 2013 or erstwhile act has to mandatorily file Annual Return in e-form MGT-7 and financial statement in e-form AOC-4 after ending of the financial year as per provisions prescribed under companies Act. For which companies act also prescribed the time limit within which the forms shall be filled to the registrar of the company (ROC) and also specifically provides for additional fees and penalty provision in case of delay in filling. In this article, we are going to discuss the due dates of filing annual returns forms and major changes introduced with regard to additional fees and penalty provision. A copy of the financial statement, including consolidated financial statement, if any, along with all the documents which are required to be or attached to such financial statements under this Act, duly adopted at the annual general meeting of the company, shall be filed with the Registrar within thirty days of the date of annual general meeting in such manner, with such fees or additional fees as may be prescribed within the time specified under section 403. Every company shall file with the Registrar a copy of the annual return, within sixty days from the date on which the annual general meeting is held or where no annual general meeting is held in any year within sixty days from the date on which the annual general meeting should have been held. Here one can conclude that according to section 137 and 92 company have to file the financial statement and Annual Return within 30 and 60 days of Annual General Meeting respectively. If Company fails to file the same within a prescribed period of 30 and 60 days than with additional fees can file within the time mentioned under Section 403 (i.e. 270 additional days). The time limit prescribed for the filing of Form MGT-7 under section 92(4) of companies act 2013, related to filing of Annual return is 60 days from the date of holding of Annual General Meeting (AGM) and the time limit for filing the financial statements in Form AOC-4 under section 137(1), is 30 days from the date of holding of Annual general meeting. Amendment has been made to section 403 which deals with fees for filing. The proviso to sub-section (1) has been substituted to provide that the Annual return or the Financial Statements of a company if not filed within the prescribed time can be filed on payment of an additional fee as may be prescribed, which shall not be less than one hundred rupees per day and different amounts may be prescribed for different classes of companies. It has been further provided that in case of default on two or more occasions the document can be filed on payment of a higher additional fee, as may be prescribed and which shall not be lesser than twice the rate of additional fee i.e. the Higher Additional fee shall be at least Rs. 200/- per day. In perspective of enhancing compliance, Ministry of corporate affairs has made the penalty provision more stringent, now it is imperative that the annual returns shall be filed within the due dates specified in section 137 and 92 of companies act 2013. 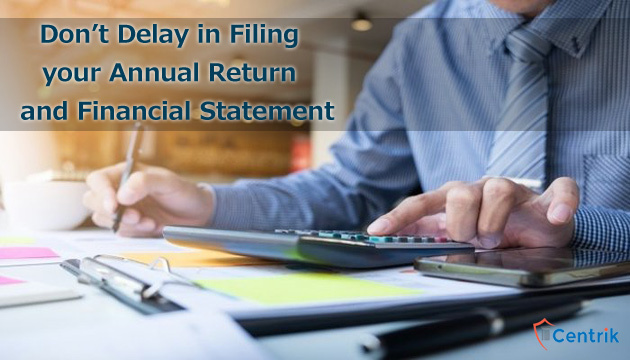 Any delay in filing of annual returns and financial statement leads to hefty fees and penalties.